Shirt size charts are available on our product page descriptions. Shirts are cut true to size and are meant to fit better than your dad’s Hawaiian. Our size chart should help you find your size. If you’re still torn, shoot us a message or read more below. We want you looking and feeling great out there. We have two different fits for however you want to get down. Regulaxed - None of that boxy shape, wizard sleeve play where you can't see or lick your elbow. These shirts are better fitting than your typical Hawaiian shirt and a little more relaxed than your every-day shirt. We designed them to be accommodating in the chest, shoulders and waist while still maintaining a modern silhouette. If you’re a bit stronger in any dimension, we recommend sizing up for cool, casual comfort. Slim - Roll up your sleeves and rock this nice fit in the city, on the beach, at a brunch or out at night. Not too slim, not too regular. This option is more structured in the chest/shoulders with a bit more taper in the waist. How should I wash these shirts? Will they shrink? NOTE: You may also dry clean these bad boys for a consistently fresh, crisp look. We also have cotton shirts. As explained on their tags – play it cool, machine wash cold, hang to dry. When it comes to cotton, you’re basically wearing nature. Cotton is a natural fabric and a relatively easy one to maintain. Like your favorite DJ spins groovy tunes at a pool party, you can spin your cotton garment in a washing machine. After machine-washing it, you have a couple options. You can choose to either machine dry or hang dry your button-buddy. We all love the heat, but keep in mind that high temperatures in the dryer could put cotton garments at risk of shrinkage. Yes I said the “s” word – sorry, ladies. You might also get some wrinkles (classic cotton), but nothing a little ironing can’t handle. If you are experiencing a little shrinkage, we recommend ironing over the shirt to loosen things up a bit. Do the shirts fit women? Of course. Have you seen the pics? As an inevitable side effect of creating a bloomin' remix of the guys' classic Hawaiian shirt, girls look great in them too. Depending on how she likes her shirts to fit, we'd recommend sizing her shirts similarly to how she'd expect one of your hoodies or t-shirts to fit. But remember guys, just like with those hoodies and college tees, be careful letting her wear yours. You may never see it again. How does the sunglass loop work? Simple as putting on flip flops. You end up dartying (act of partying during the day) longer than you thought, so long that it actually gets dark outside and you realize you don't want to be the guy wearing sunglasses at night. Nor do you want them to break when you’re breaking out your best/worst moves. Or you just want to look deeply into a lovely lady’s eyes for a second. Whatever the scenario, keep your sunglasses in the front pocket loop and have even less to worry about. The specially designed loop inside the front pocket, only available on Kenny Flowers shirts, will keep those sunglasses snug so they don’t fall out of the pocket. These aren’t your everyday plastic button, these are fine, finished coconuttons. They’re all-natural, non-GMO and probably gluten-free too. The lighter ones are from baby coconuts. Treat them nicely. We attach an extra to the shirt in case one doesn't survive an adventure of yours. How are the shirts made? 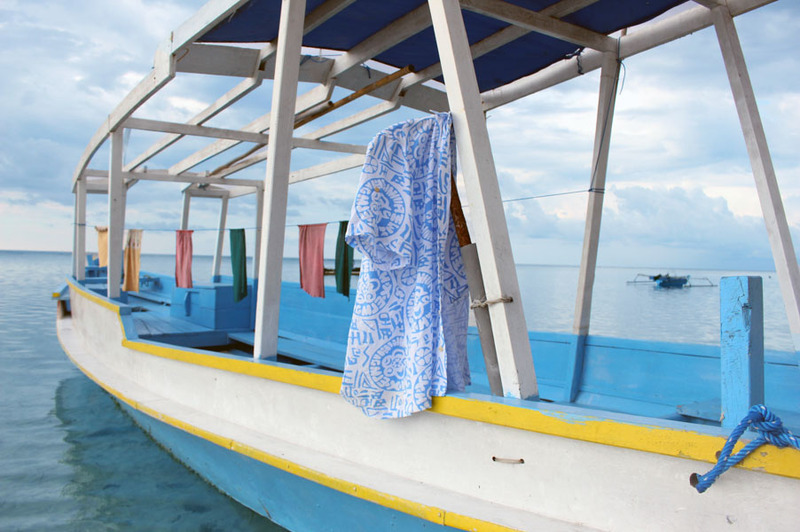 We first explore the whole island of Bali to find the coolest, highest quality fabrics out there and work on fun designs with young, talented local artisans. Then, the shirts themselves are made fresh in a beautiful little factory surrounded by Bali rice fields. Working conditions are good here, with lots of time taken off to participate in village ceremonies and hang with their families. We hope you feel great knowing that the KF shirts you rock were made with the best of energy and a strong work/life balance by everyone involved. How do I know my trunk size? Our mid-length swim trunks are meant to fit and feel better than anything you’ve ever worn to a swim-up bar. This size chart should help you find the right size so you can comfortably party underwater. If you find yourself on the fence between sizes, just order the smaller size for a slightly shorter, tighter fit and the larger size for a slightly longer, looser fit. We believe in showing a little thigh while still looking classy at the pool and around town. Smalls & Mediums have a 6 inch inseam. Larges and Extra-Larges have a 6.5 inch inseam. How should I wash these bad boys? Pretty simple stuff here - we recommend washing normal (machine wash cold) and then hanging these high-performers to dry. They love the sun as much as you do, so if you’re not wearing them, and a balcony permits, we recommend drying them out in the warmth. Just make sure no one at your resort jacks them. When will my Watercolors suit arrive? We’re working hard to get you splashing around in your new suit as soon as possible. If you’re ordering pre-order (before 3/15), your suit will arrive sometime mid/late March. After the pre-order sale, suits ordered before Noon Eastern Time will arrive within 3-5 business days on standard shipping, or you can opt for 2-day shipping if you need it in time for a special occasion. How do I figure out my size for Watercolors swim? Check out the Watercolors size guide below, and make sure you’re taking all three measurements and using the largest of the three for your size. How should I care for my Watercolors one piece? We want your new Watercolors to last you for endless pool parties, beach vacays, and days in the sun. So here are some quick and easy tips to keep your suit in prime condition, for every wear (and everywhere) around the world. Wash Your Suit ASAP After Each Wear – Even if you don't go in the water, sand, sunscreen and your body's natural oils can still wear down a swimsuit. You can easily extend the life of your beautiful one piece by making sure to (gently) wash your suit after every wear! Hand Wash & Be Gentle – Always hand wash your suit! Our favorite bikini washing formula is combining cold water + just a touch of gentle laundry detergent. Let it soak for 5-10 minutes then rinse it out gently. Lay flat to dry. No Bleach, Just Beach – Even on white swimwear, stay away from bleach. For spot cleaning, a little bit of Shout will do the trick! Don't Dry Your Watercolors in Direct Sunlight – If you're drying your swimsuits outside, hang or lay them in the shade. Drying in the sun too long can cause discoloring and fading! Stay Away from Heat – Never, ever, ever iron or throw your suits in the dryer! Just like sunlight, too much heat can cause fading or terrible damage to the fabric. Always opt for hang drying, or ideally lying flat. Which Watercolors suits have matching guys’ suits? If you’re interested in matching your guy on your next vacation, check out our page on Kenny Flowers matching couples vacation outfits. The South Beach matches up perfectly with The Flamigos, and The Rio - White and The Rio - Coral go very well with The Toucan Tango - Mint. The Indio matches well with The Deserted Island or The Prick shirt, and The Zanzibar matches up with The Fresh Prince shirt. How long will it take to get my Kenny Flowers? We’re as excited as you to get you your new KF gear. You can expect a smooth USPS delivery within 3-5 days and some great gear for your next adventure. If you need your order in a hurry, please select our expedited option during checkout and we’ll take care of it from there. Please allow 1 business day for processing during the week, or expect your order to ship on Monday if you order on the weekend. We aim to ship your order out the same day, but we are a small business and can’t always get to every order that day. Orders placed before Noon Eastern Time will get priority at the warehouse. You will be emailed a tracking number after your order has been shipped. It’s our goal to make sure you’re completely happy with your order. If your shirt isn’t just the way you like it, we’ll make things right best we can. Exchange shipping is always free. Return shipping is free when for store credit and deducted if you prefer a refund. We’ll reimburse you once we have received the product and confirmed there are no cranberry vodka spills, cigar burns or lipstick kisses on it (please allow 5-10 business days). Thanks for understanding, as we are a small business. Shoot us an email holla@kennyflowers.co, letting us know your order #, what you would like to send back, and what you would like to do so we can get you set up with a prepaid return label. Once we send the prepaid label, it remains usable for 1 week. Note: We'll do our best to make sure you have a positive experience. We’re open to feedback but if you’re unnecessarily rude to our team, we’ll happily deduct an additional handling fee from your refund and go grab a beer. Returns on Swim Trunks: We can not accept any swim trunks that have been worn or washed. If the hang tag has been removed from the swimsuit or it has been worn we can not accept the item for return/exchange. Product Sales: All items discounted on the product page are a final sale and not available for return, exchange, refund. Group Orders: All group orders are a final sale and not available for return/refund. If a size or two doesn’t work out, we’re of course happy to get shirts swapped out appropriately so no one misses out. Holiday Time: All purchases made now through the holidays are eligible for exchange/return up until January 15. I HAVE A SPECIAL OCCASION COMING UP AND I WANT TO DO A GROUP ORDER. WHAT DO YOU GUYS OFFER? That’s an amazing idea – and good news, we are here to help get you and your group geared up for bachelor parties, bachelorette parties, groomsmen gifts, bridal party gifts, reunions, group trips, family vacations and office Fridays alike. 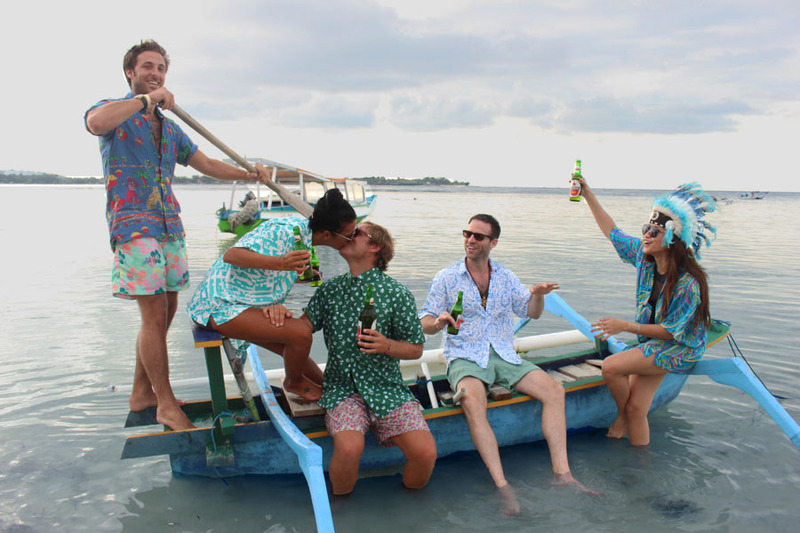 Whether you want the whole crew in matching shirts, kimonos, sarongs, or maybe even something custom, let’s make it happen. We are also happy to help with a mix and match order if matching the whole crew isn’t your vibe. If you pretty much know what you want to order, use code GARDENPARTY at checkout, to get a special 20% off your 8+ item order today. In fact, you can use code GARDENPARTY at checkout, to get a special 20% off your 8+ shirt order today. If you need help choosing items and coordinating orders, please shoot us an email at party@kennyflowers.co and we’ll be your personal party outfit concierge. THE PRODUCT I WANT IS SOLD OUT, WHAT THE HECK DO I DO? WHAT HAPPENS WHEN YOU SELL OUT? Sign up for an email on the product page for when the item comes back in stock! If you don’t see the option to sign up for an email, it was probably limited edition. Each product is made carefully in small batches. Our factories in Bali and Colombia are hard at work reproducing current styles and creating new styles. If you still have questions, or REALLY need an item, shoot us an email at support@kennyflowers.co and we will help you as best we can. I live outside of the US. Can I still rock KF? We love the idea of you rocking KF overseas. We offer international shipping so you can live your dream, wherever you are. Please note that any customs, duties, taxes, fees charged by foreign governments are your responsibility.